There are so many misconceptions and myths out there surrounding implant dentistry. This case shows the facts about implant dentistry and some of the options. This is a case on a female patient in her 60’s. Her tooth #30 a first molar, had a root canal and a crown done years ago. It worked for a very long time then expectantly it broke off at the gum line. The way in which this tooth broke left it un-restorable and unfortunately had to be extracted. See the first xray. A tooth breaking in this way doesn’t happen very often, thank heavens. The patient has several options after extracting the tooth. 1- Do nothing. leave the space let the teeth drift which will effect the bite and health of the teeth. 2- Replace the tooth with a partial denture. This option can be done effectively, but the appliance comes in and out of the mouth and would go all the around the lower arch. 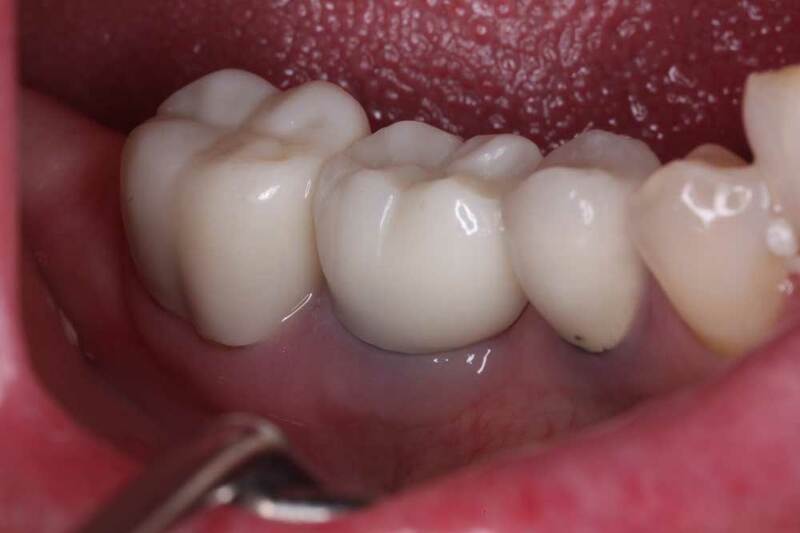 3- A fixed partial denture, also known as a bridge can be done. This is a good option. It will function for the most part like natural teeth with the exception of the way it has to be flossed. 5- On the day the tooth is removed place an implant. This allows an implant to be done and restored in the least amount of time. It has a little less success rate then waiting for full healing. In this case she choose to take the tooth out and the same day place an implant. This was done and the implant was very stable at the time it was done. It was allowed to heal for many weeks then once the gingiva was healed the restoration of the implant with a crown was started. 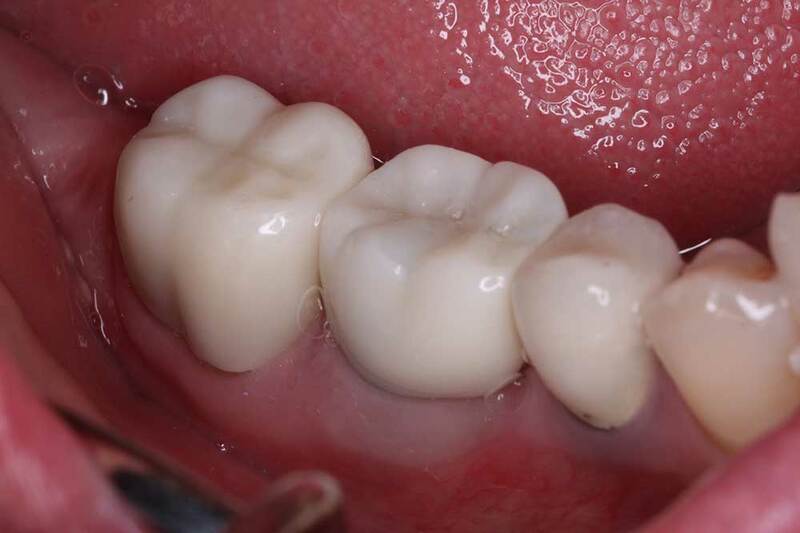 In this case I really want to focus on the two main types of crowns that can be done on an implant. 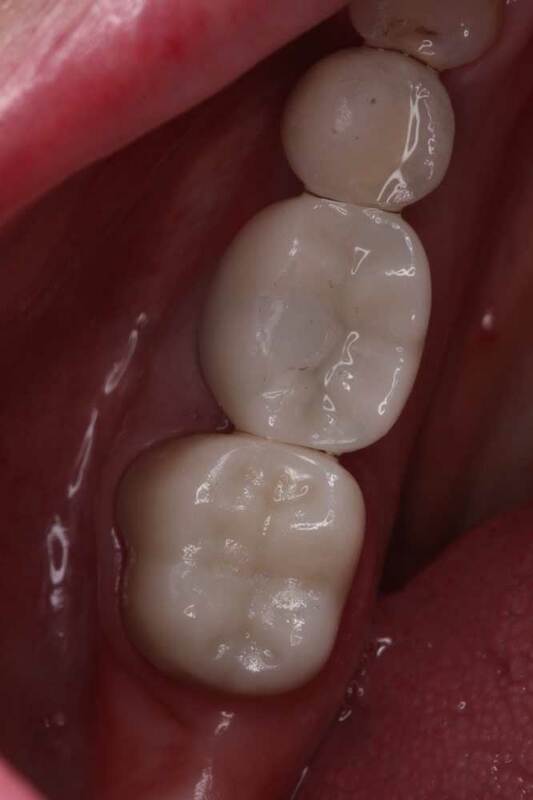 1- There are cement retained crowns. These work like a crown on a tooth. 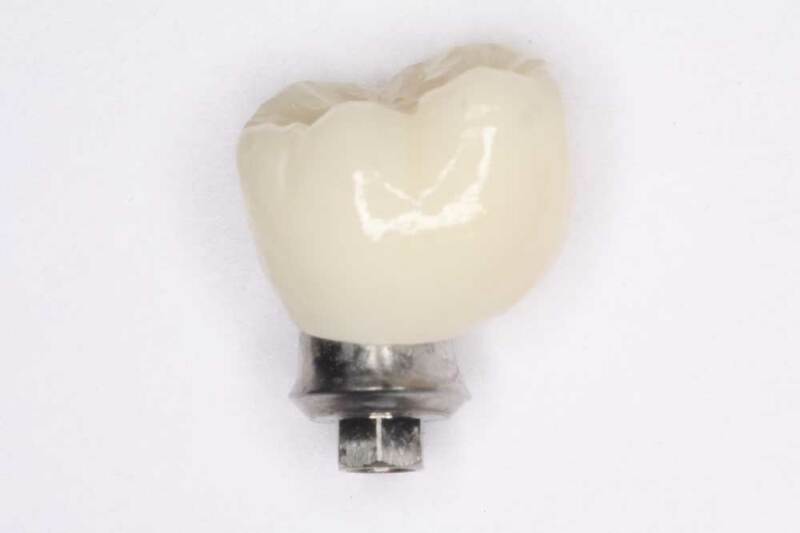 The abutment is placed on the implant, this abutment can be a stock or a custom milled abutment. Then the crown is cemented on this abutment. 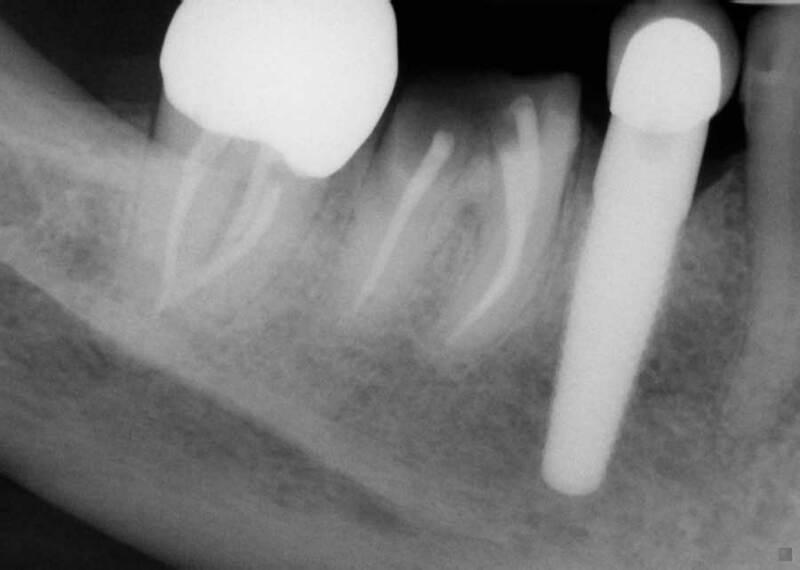 2- Screw retained crowns. These crowns are made to be screwed into the implant body. There is no cement used. There are many advantages and dis-advantages to each. I am not going to get into the long and lengthy discussion here. In general cement retained restoration have a disadvantage in that cement can be forced into the implant threads and lead to bone loss. But they do not have a screw hole in the crown. In contrast screw retained crowns for implants have a hole in them for the screw which has to be filled but they don’t have any cement used that can place the implant in peril. 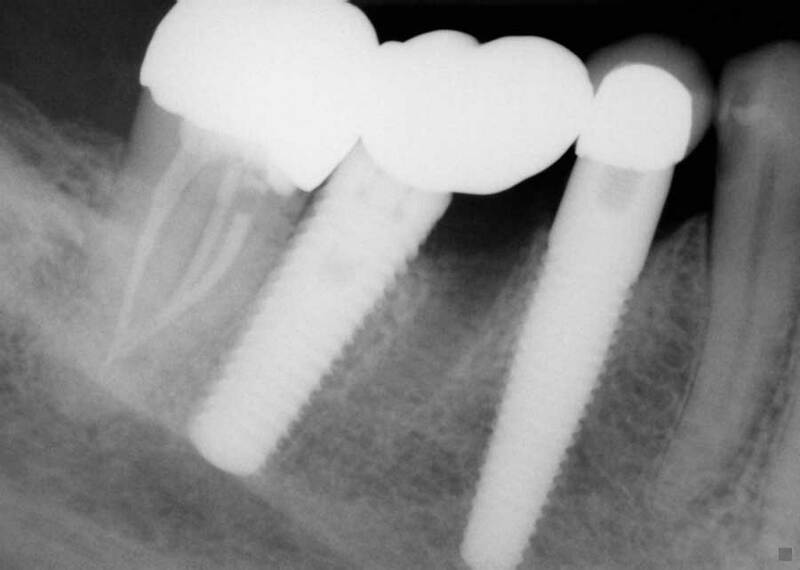 Right now screw retained implants are favored by the majority of the profession. On this case I made two crowns for this implant. 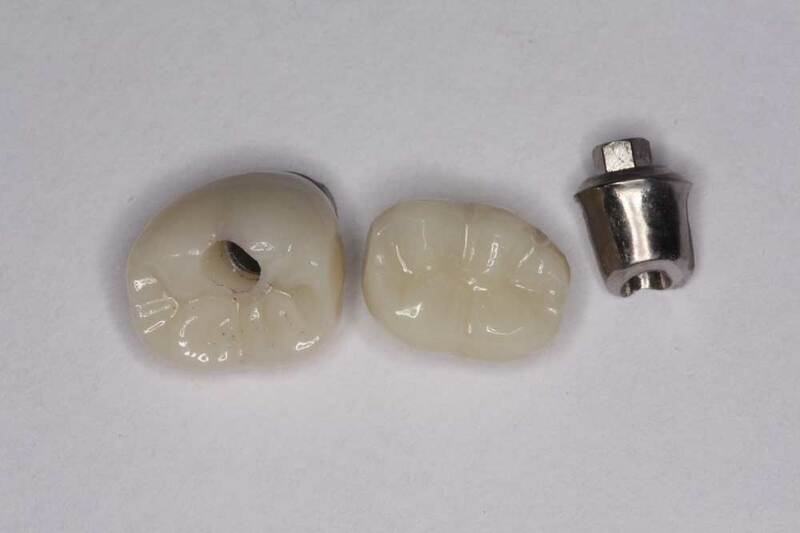 I made one that is a screw retained implant crown, (you can see the hole in the biting surface of the crown in the pictures) and the other is a cement retained crown, with a custom milled abutment. Both of these crowns were made using a Trios 3 shape digital scanner. This is the top of the line scanner in dentistry today. It can be used to make a crown using a modeless technique or it can be used to have a model 3 dimensional printed. The screw retained crown was made without the aid of a model. We call this a modeless crown. The scan flag is placed on the implant temporarily while we scan the teeth. It takes about 3 minutes to complete then the scan flag is removed. The scan is then sent electronically to Oral Arts Dental Laboratory in Huntsville, Alabama. 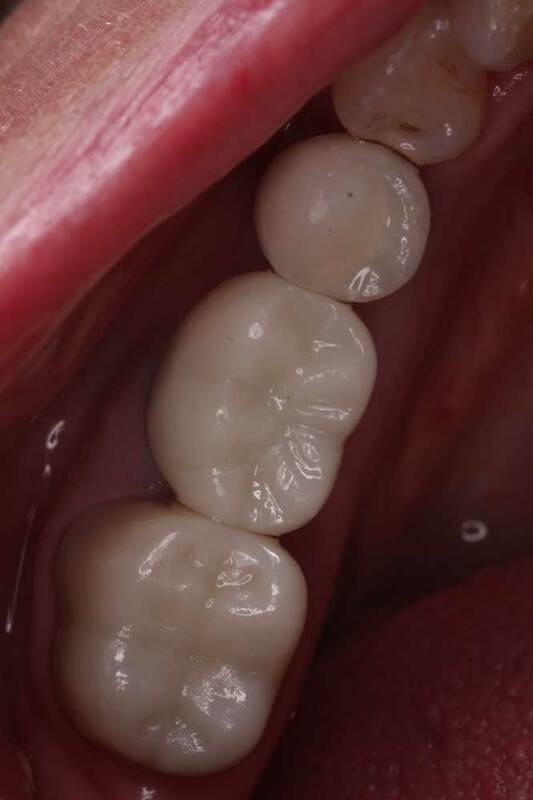 A cement retained crown was also fabricated. The day came for the crown to be placed on the patient’s implant. As you can see in the pictures we placed both restorations on her implant for her to try. She like both crowns and thought that either was excellent. 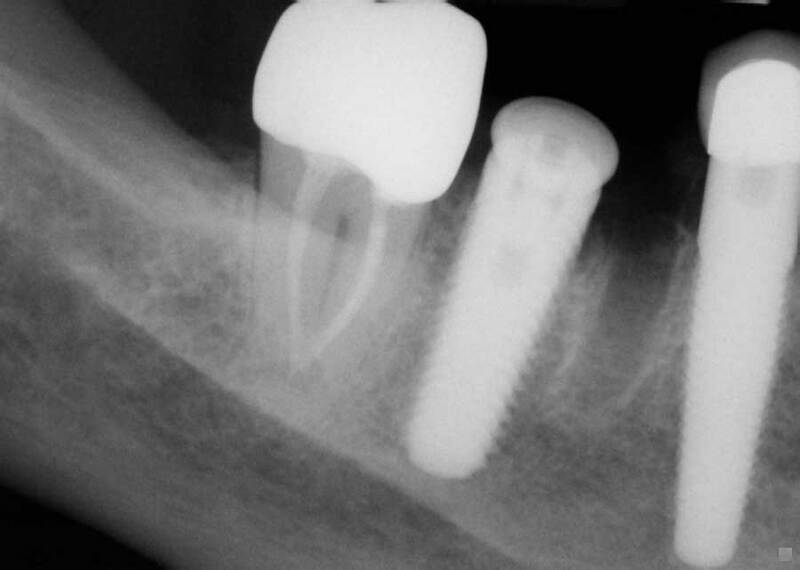 She choose to have the screw retained crown placed permanently on her implant. She thought it was slightly more comfortable. 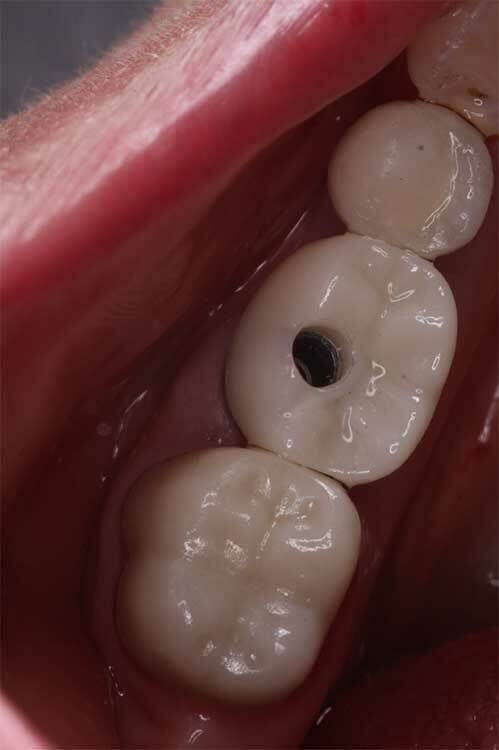 The crown was placed and torqued to specifications and the “hole” was filled with composite filling material. The seating appointment takes about ten minutes most of the time. She was very happy and thought the tooth looked like it grew there. Implant dentistry is wonderful. The lady in this case took one pain pill after the extraction of the tooth and the placement of the implant. She reported almost no pain. From start to finish this implant and crown tooth a total of 4 weeks. Implant dentistry affords the patient many options for tooth replacement. Fig 1- Pre-op x-ray showing unrestorable molar. 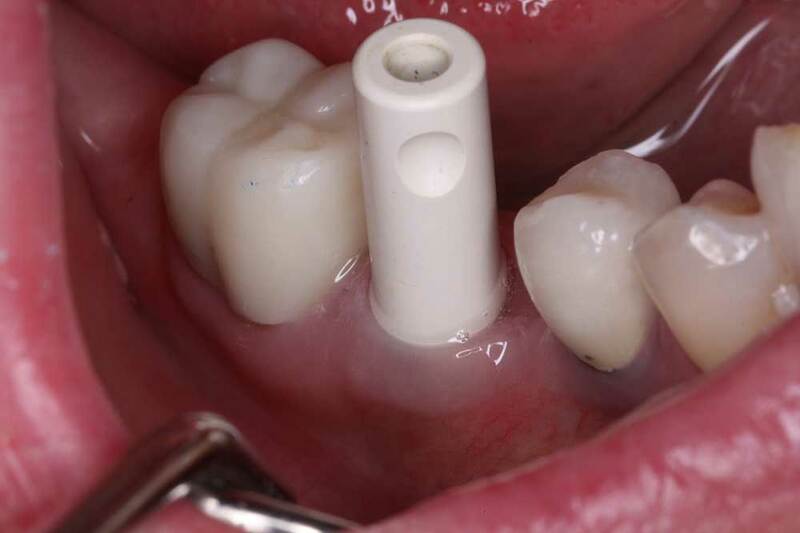 Fig 2- Custom milled abutment and crown that will be cemented on abutment. Fig 3 – On left screw retained crown, cement retained crown and custom abutment for cement retained crown. Fig 5- Inclusive scan body. 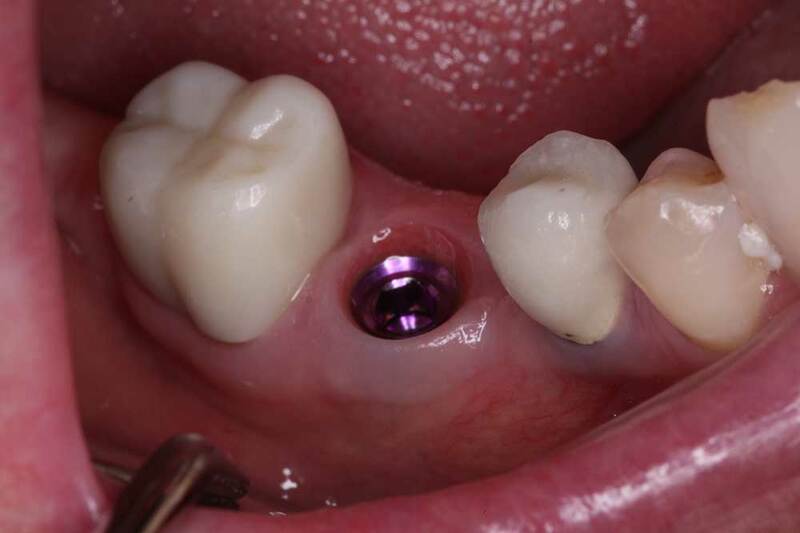 Fig 6 – Screw retained crown after filling placed to fill screw hole.